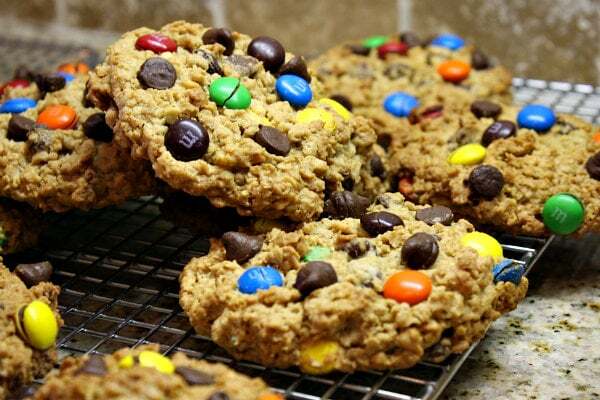 These Monster Cookies are seriously the best recipe for Monster Cookies on the internet. Watch short video showing you how to make them, then scroll to the end of this post to print out the recipe so you can bake them at home. This post should be titled, “Out of Sight, Out of Mind!” or “Hiding Cookies in Your Freezer is a Good Idea!” Or better yet, “When Cookies Are in My Freezer, I Don’t Remember They’re There!” Only I’d be lying to myself. I bake cookies and put them in little ziploc baggies and place them in the freezer for instant munching for the boys in my house. I tell myself that since they’re in the freezer, they’re totally safe. Safe from ME. Safe from my strong desire to eat something sweet at a certain time of day. That little trick seems to work at first, until my cravings turn mad and uncontrollable. I try to tell myself that frozen cookies aren’t any good. But guess what? They’re good. They’re actually better than un-frozen cookies. And so it goes that these Monster Cookies are dangerous. They’re dangerous to have around because you’ll want to gobble far too many of them! Monster cookies aren’t anything new. They’ve been around a very long time, and this recipe was tucked into my collection sometime way back in my pre-teen years. Someone… somewhere made them up- Betty Crocker, I’m guessing. They are indeed a cookie recipe worth keeping around for decades. 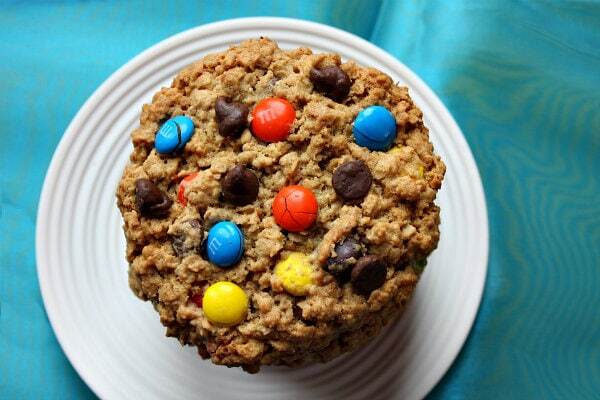 Monster Cookies are basically a peanut butter- oatmeal cookie with chocolate chips and M&M candies mixed in. There is no flour at all in the recipe! I dot extra M&M’s and chocolate chips on top of each blob of cookie dough on the baking sheet. This ensures that they will be extra pretty when they are all baked up and ready to eat. Sometimes I bake GIANT Monster Cookies (using an ice cream scoop to dole out the dough). If you go the giant route, you’ll end up with 22 fabulously large cookies. If you’d like to make a normal-sized cookie, you’ll get 36 cookies. 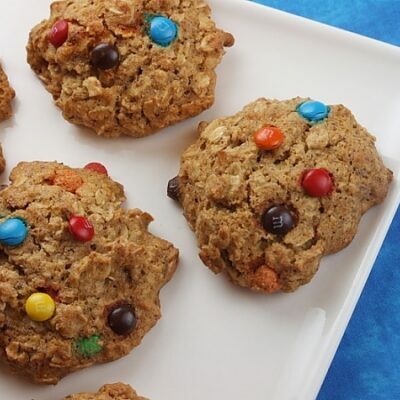 Bake some Monster Cookies today, and keep them in the freezer… where they’ll be safe! 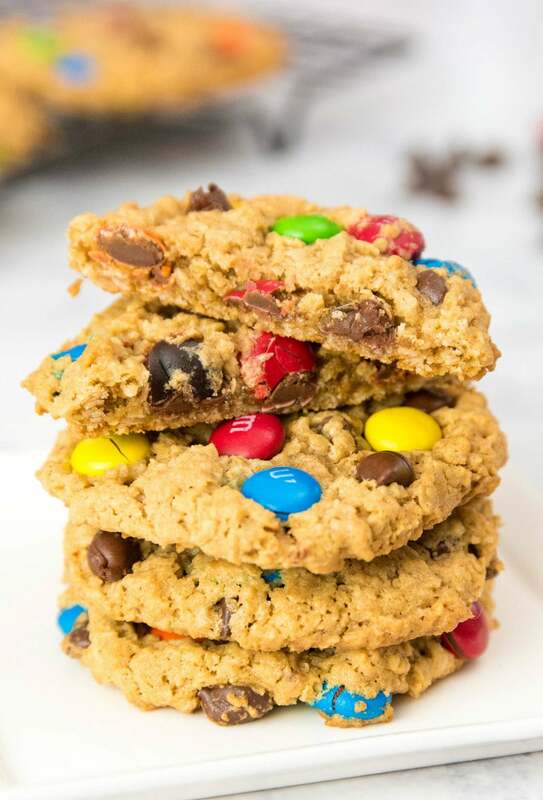 If you’re looking for more recipes using M&M’s, you might like to try my M&M Pretzel Blondies or these Super Soft Peanut Butter- M&M Cookies. 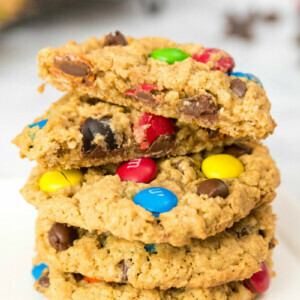 No Bake Monster Cookie Bars, M&M Shortbread Cookies and Kit Kat Cake are good recipes to try too! 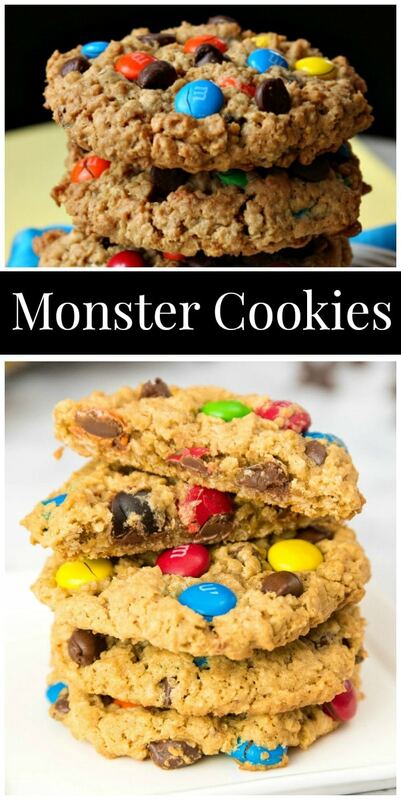 This is the absolute best recipe for Monster Cookies! Preheat oven to 350°F. Spray cookie sheets with nonstick spray, or line with parchment paper or a silpat mats. In a large bowl, combine the peanut butter with the sugars and butter. Use an electric mixer to mix until well combined. Mix in the eggs and vanilla. Mix in the oats and baking soda. Then stir in the chips and M&M's. Drop the cookies by heaping spoonfuls onto the prepared cookie sheets. 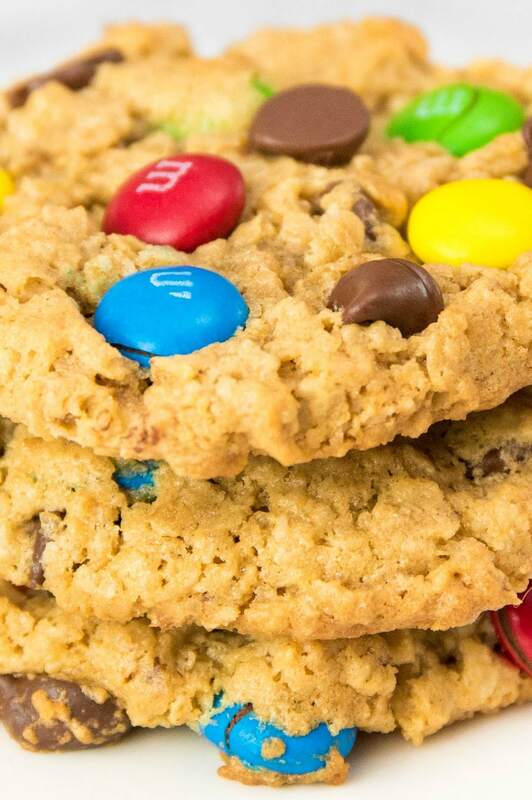 If you'd like your cookies to look pretty (like the photos), dot a few extra M&M's and chocolate chips on each mound of dough before baking. Bake 10 to 12 minutes. Do not overbake. Cool for 5 minutes on cookie sheets until cookies are set. Transfer to wire racks; cool completely before storing in an airtight container. 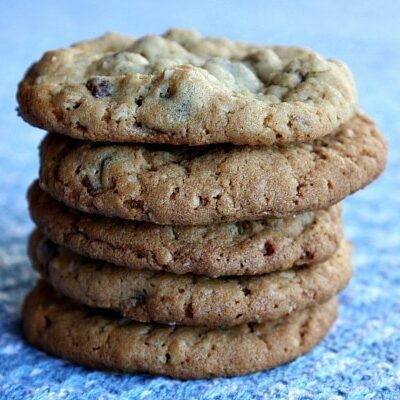 If you are preparing this cookie as gluten-free, just be sure to make sure you are using brands of the following items that are known to be GF: peanut butter, vanilla, oats, chocolate chips and M&M's. If you'd prefer to make giant cookies, use an ice cream scoop instead to scoop the dough onto the cookie sheet. They'll need to bake for 18 to 20 minutes, and you'll end up with about 22 cookies. 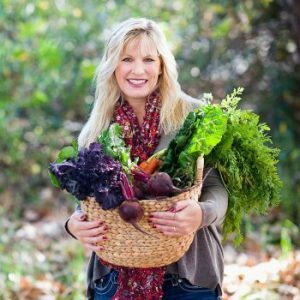 If you are following a special diet, be sure to check labels of the products you’re using for this recipe to make sure they’re free of any specific ingredients that may be harmful to you. This recipe was originally shared in 2012. It was edited and re-published in 2018. I want one of these right now! My stomach is growling just reading the recipe! 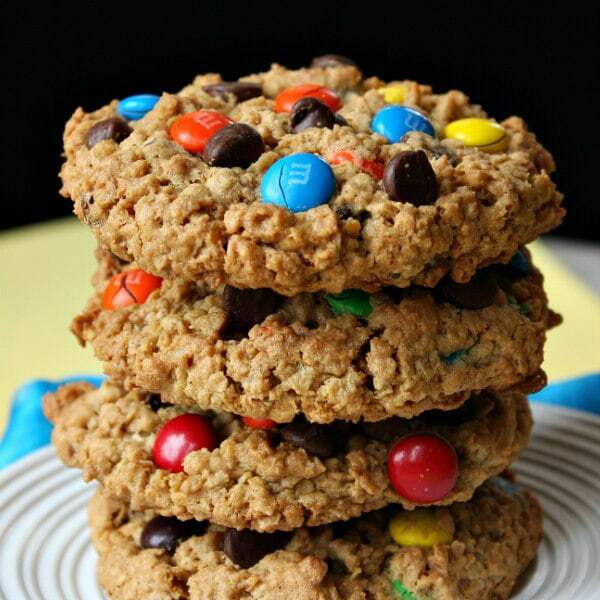 As a self proclaimed “M&M monster”, I can never get enough of these cookies. SOOOO good. I love how big and hearty these are! These are very sweet, but not “too sweet” as some have commented. They are a special treat, not a health-snack. I used kraft smooth peanut butter and they spread just fine. 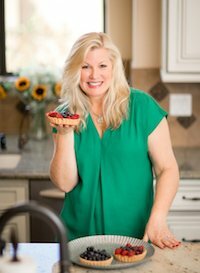 If you are trying to make a health-cookie, you need to expect that changing the recipe will change the final product… end of story! Lovely recipe! Thanks for sharing! I have made this recipe COUNTLESS times! 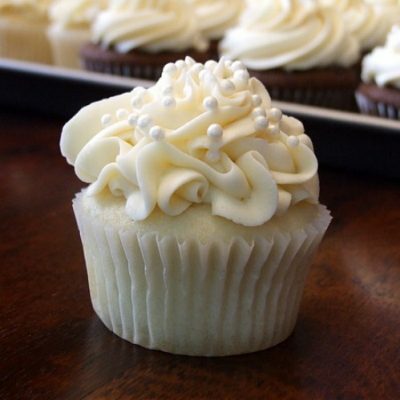 They are always a favorite and a go-to recipe for any and every occasion. The one and only time these didn’t turn out perfectly was when I used “natural” peanut butter. They weren’t as soft or chewy and got hard after a few days. I’ve since learned to always keep standard peanut butter on hand, if for nothing else besides this recipe. Also love adding in butterscotch or white chips. Thanks for this great recipe! How can I modify the recipe not using peanut butter? My daughter is allergic? I’m not sure what you would substitute. I think you’d be better off just making oatmeal cookies and adding MM’s. 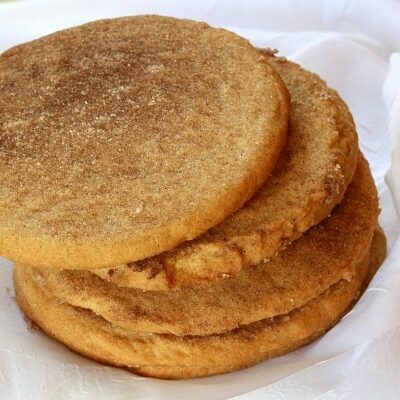 I love these cookies…especially because they have no flour. I have used Splenda in place of sugar and it works well but I think it’s just as bad or worse than using sugar. I also have used M&M peanuts and mix choc. and peanut butter chips. Great recipe!! This is a GREAT recipe! You get lots of nice size cookies, and the flavor is great. These cookies are awesome, but how do you get the batter to stick to the candies and the chocolate? These cookies never spread! I ended up overbaking them because they never took on a cookie shape. Does anyone press them before baking, or do you leave them in scoop form? I haven’t had a problem with that- are you using regular peanut butter — like Skippy or Jif? Sounds like a good variation! I think the peanut butter was definitely the culprit. I always use the regular Skippy or Jif. AMAZING RECIPE!. I chilled the dough balls on the cookie sheet for 10 minutes before baking and they kept a nice round shape. Thanks for publishing this recipe! I like to use some peanut butter chips also. Best Best Best cookie recipe ever!! Love these Monster Cookies! Thanks! These cookies are phenominal! I’ve made them in various sizes (but adjusted the cooking time by visually checking for lightly browned edges) and have had great results every single time! 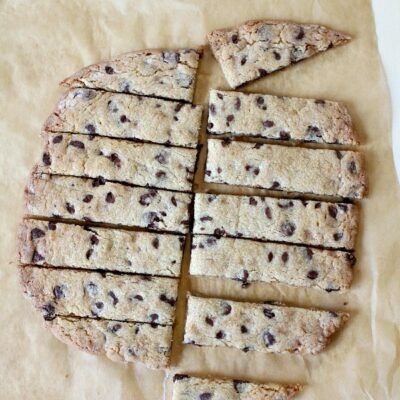 This is hands-down my favorite cookie recipe! This recipe is the best!!! 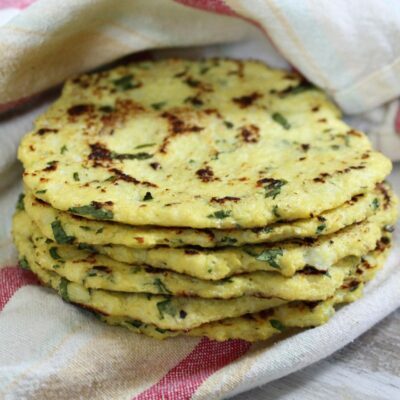 I have tried many other recipes and this one is simply the best. Love them!!! Hubby approved!! !